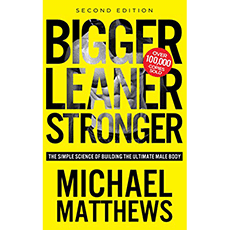 “Bigger Leaner Stronger” (Second Edition) shows men how to naturally build muscle, lose fat, and look great as quickly as possible, while saving time from the gym. Michael Matthews aims to debunk the fitness myths promoted by the fitness industry and help you achieve the body you desire. Here’s what the kings of the multi-billion dollar fitness industry don’t want you to know. - I Want to Change the Supplement Industry. Will You Join Me?